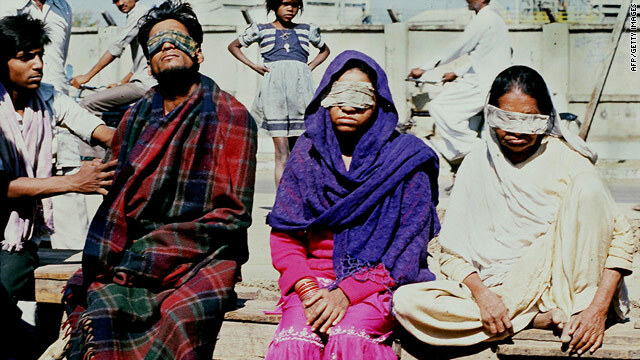 New Delhi, India (CNN) -- India has announced a new financial package for victims of the 1984 Bhopal gas disaster as the case shot back to prominence after a court ruling this month. The country's Cabinet has sanctioned about $270 million as part of plans to compensate the victims and clean up what is now a defunct plant of Union Carbide India Limited (UCIL) in the central city of Bhopal, authorities said. Information and broadcasting minister Ambika Soni told reporters Thursday that the new financial assistance would be delivered to more than 45,000 people deemed severely hit by the leak of poisonous gas from the pesticide factory 26 years ago. Deaths, disabilities, cancer and total renal failures from the exposure will be covered under the package, she said. Nearly 4,000 people died in the immediate aftermath of the escape of methyl isocyanate, a chemical used to produce pesticides, from the company's plant in Bhopal in December 1984. More than 10,000 other deaths have been blamed on related illnesses, with adverse health effects reported in hundreds of thousands of survivors. Many of them struggle with ailments including shortness of breath, cancer, near-blindness, fatigue and heart problems. The ruling sparked an outcry in India, with both government and judiciary coming under heavy criticism for their handling of what has been regarded as one of the world's worst industrial disasters. Originally, the Indian defendants were tried on the count of culpable homicide. After an appeal, the country's supreme court downgraded the charges to death by negligence in 1996. Soni said the top court would now be petitioned again to revisit its 1996 scrapping of tougher charges. As advised by a ministerial panel this week, India will also push the United States to extradite Warren Anderson, the former head of Union Carbide Corp., she said. Anderson has been declared a fugitive from the Bhopal indictment in India, with an arrest warrant out for him. Indian authorities, officials say, will use new evidence in support of the extradition plea: testimonies that the parent company was aware of what investigators believe were defects in its Bhopal plant. India's federal police first requested that the United States extradite Anderson in 1993. "However, this request remains unexecuted," the Central Bureau of Investigation noted in its statement on June 7, the day of the Bhopal ruling. Currently, India has extradition pacts with 31 countries, including the United States. Investigators have blamed the Bhopal tragedy on the maintenance and design of the site. Union Carbide, however, said the leak was an act of sabotage by an employee who it said had tampered with the gas tank. The company, now a subsidiary of Dow Chemical Co., paid a $470 million settlement to India in 1989. But the International Campaign for Justice in Bhopal said survivors had so far received an average of only $500 each in compensation. Sixteen years after the leak, Union Carbide became part of the Dow Chemical Corp. Union Carbide claims the issue has been resolved and Dow has no responsibility for the leak. In her briefing, however, Soni said the government would pursue courts dealing with liability litigations. "Appropriate applications may be filed before the courts concerned and request the courts ... to expeditiously decide the question of liability of the Dow Chemical company and/or any other successor to UCC, UCIL," she said. Also, India's Cabinet recommended the country's attorney general examine the possibility of approaching the top court again for reconsideration of the 1989 settlement of $470 million.